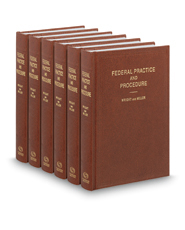 Comprehensive and authoritative coverage of all aspects of federal civil, criminal and appellate procedure, including rules of civil, criminal, and appellate procedure, rules of evidence, the federal judicial system, jurisdiction of all federal courts, venue, removal of cases, res judicata, relation of state and federal courts, multidistrict litigation, and more. Provides extensive analysis of each rule as interpreted and applied by the federal courts and affected by related statutes and rules. Includes official forms adopted with the rules. Contains numerous tables and couples key words, ideas, and legal concepts to index and cited decisions, statutes, and other relevant materials.